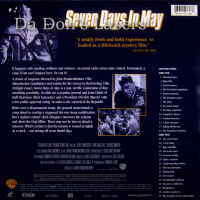 Seven Days in May 1964 - 117 min. - Black and White Genre: Thriller Rated R Country: USA LaserDisc Movie Storyline: Burt Lancaster stars as General James Scott in Frankenheimer's film of Rod Serling's adaptation of Fletcher Knebel and Charles Waldo Bailey's bestselling novel set in the early 1960s. Like much of the American public, Gen. Scott, Chairman of the U.S. Joint Chiefs of Staff is unhappy with a nuclear arms pact with the Soviet Union recently signed by President Jordan Lyman (Fredric March). 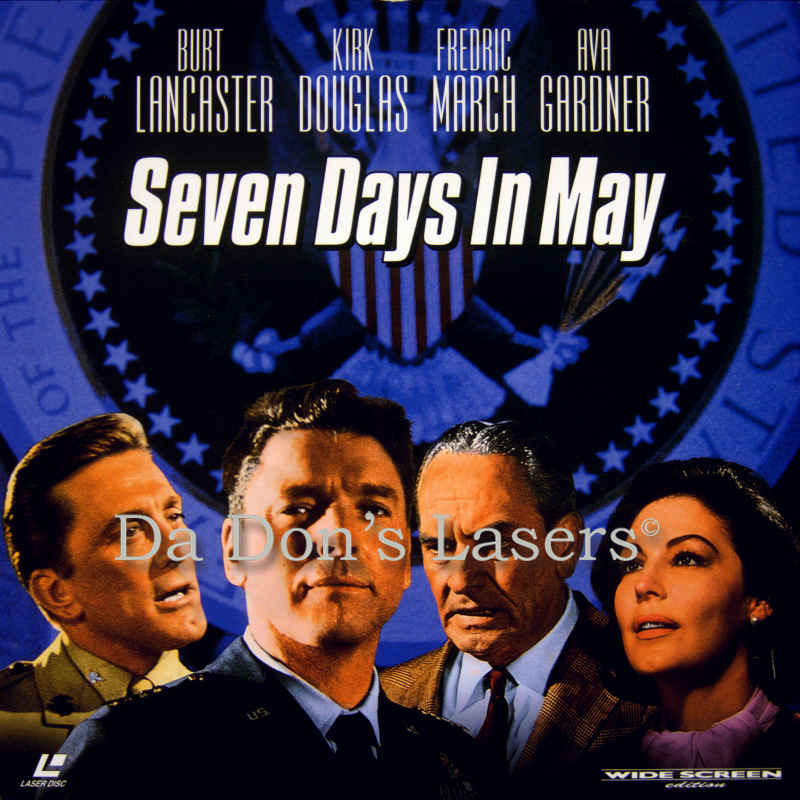 But the extent of Scott's displeasure is not fully understood until his aide, Col. Martin "Jiggs" Casey (Kirk Douglas), finds some messages suggesting that the general and the Joint Chiefs have been planning a military takeover of the government at a top-secret air base in Texas. 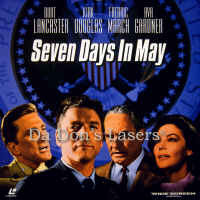 The plan is scheduled to go into effect in seven days, while the president is in sequestration during a military drill. 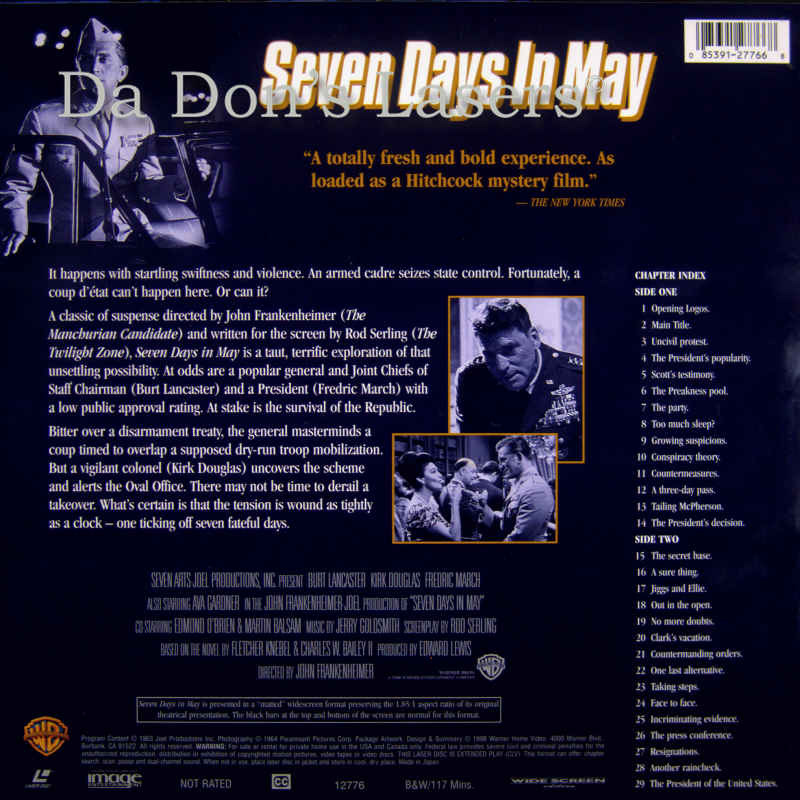 Duly informed, the President sends Senator Raymond Clark (Edmond O'Brien), to investigate the base, and the Senator is held there against his will. In Gibraltar, presidential aide Paul Girard (Martin Balsam) obtains evidence of the coup from Admiral Paul Barnswell (John Houseman), but after the aide is killed in the crash of his return flight, the admiral denies any knowledge of an imminent military takeover. Although dialogue-heavy for a thriller, it remains an effective slice of cold war paranoia, with echoes of the Cuban missile standoff that may have been absorbed from Frankenheimer's friend, Robert F. Kennedy.